Your event belongs at The Palm. Whether it’s a business lunch for 10, a holiday party for 50 or an extravagant wedding dinner for 100, our expert sales manager will tailor every detail to meet your needs, helping you select your menu, pair your wines, match your party to the perfect private dining room…leaving you to take the bows. Your guests will enjoy top-notch fare & hospitality while dining in a warm and inviting family owned restaurant with service that is personal, attentive, lively & memorable. 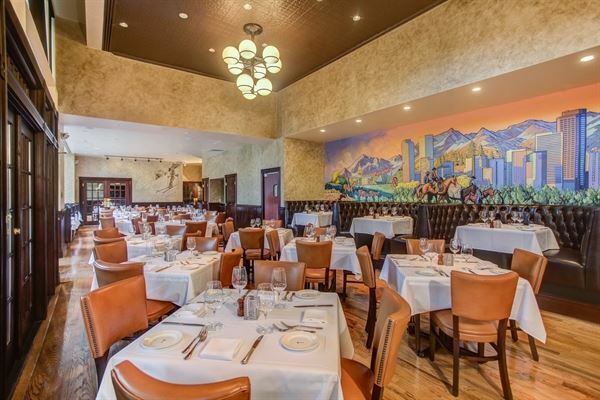 The Palm is known for aged USDA Prime Steaks, Jumbo Nova Scotia Lobsters & Italian entrees. We are The Classic American Steak House. Prices do not include sales tax or gratuity. Prices subject to change without notice. Prices do not include sales tax and 20% service charge. Prices subject to change without notice. Two additional charges will be added to your final bill. The first charge is a 15% banquet gratuity to be apportioned to the wait staff assigned to your function. The second charge is a 5% administration fee to cover The Palm Restaurant's administrative expenses for hosting your function. The administration fee does not represent a tip, gratuity or service charge for the wait staff, service employees or bartenders. Prices do not include sales tax and 20% service charge. Prices subject to change without notice. Two additional charges will be added to your final bill. The first charge is a 15% banquet gratuity to be apportioned to the wait staff assigned to your function. The second charge is a 5% administration fee to cover The Palm Restaurant’s administrative expenses for hosting your function. The administration fee does not represent a tip, gratuity or service charge for the wait staff, service employees or bartenders. Prices do not include sales tax. Prices subject to change without notice. Two additional charges will be added to your final bill. The first charge is a 15% banquet gratuity to be apportioned to the wait staff assignedto your function. The second charge is a 5% administration fee to cover The Palm Restaurant’s administrative expenses for hosting your function. The administration fee does not represent a tip, gratuity or service charge for the wait staff, service employees or bartenders. Prices do not include sales tax. Prices subject to change without notice. Two additional charges will be added to your final bill. The first charge is a 15% banquet gratuity to be apportioned to the wait staff assigned to your function. The second charge is a 5% administration fee to cover The Palm Restaurant’s administrative expenses for hosting your function. The administration fee does not represent a tip, gratuity or service charge for the wait staff, service employees or bartenders. Prices do not include sales tax. Prices subject to change without notice. Two additional charges will be added to your final bill. The first charge is a 15% banquet gratuity to be apportioned to the wait staff assigned to your function. The second charge is a 5% administration fee to cover The Palm Restaurant's administrative expenses for hosting your function. The administration fee does not represent a tip, gratuity or service charge for the wait staff, service employees or bartenders. The Colorado Room – is completely private, has direct access to our outdoor patio with a wonderful view of Skyline Park and seats up to 110 guests. Main Dining Room – is completely semi-private, has direct access to our outdoor patio with a wonderful view of Skyline Park and seats up to 100 guests. Mile High Room – is completely private, has direct access to our outdoor patio with a wonderful view of Skyline Park and seats up to 36 guests. Rocky Mountain Room – is completely private and seats up to 36 guests. Summit Room – is completely private and seats up to 36 guests.